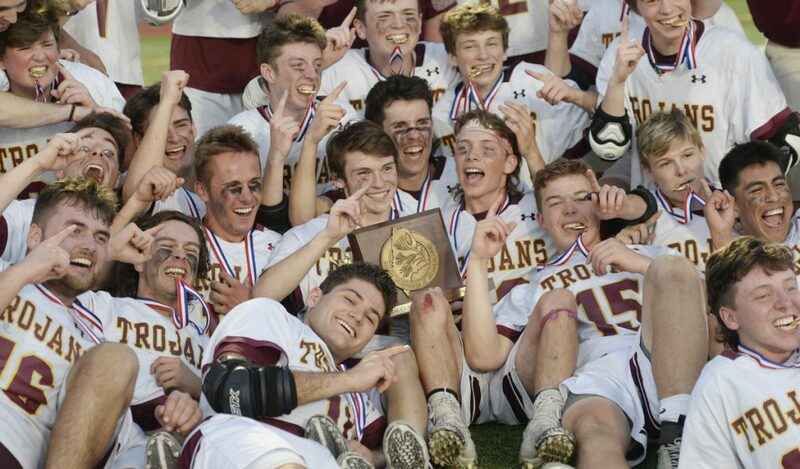 The Trojans rally in the fourth quarter to win its first boys' lacrosse title with a win over Falmouth. 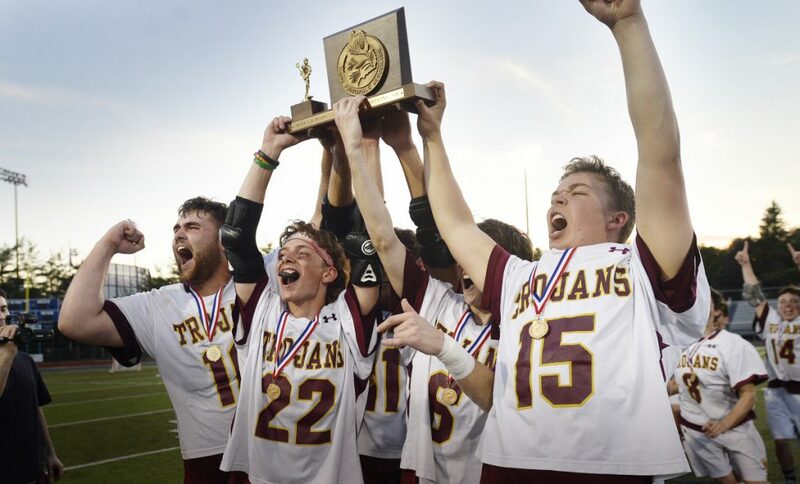 With foot stomps from its large crowd of supporters making the Fitzpatrick Stadium grandstand sound like thunder, the Thornton Academy boys’ lacrosse team found the extra edge to capture its first Class A state title Saturday and complete an undefeated season. “The crowd and our sideline got pretty wild, and it definitely lifted up our emotions. 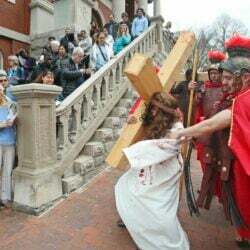 It definitely did (make) a difference for us out on the field,” said Thornton senior captain Cam Houde. 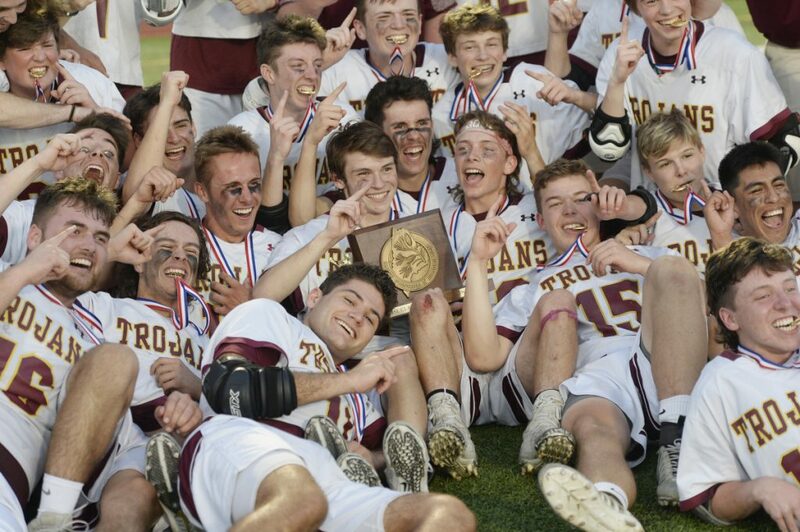 Trailing by two early in the fourth quarter, Thornton scored five straight goals to take control and beat Falmouth, 14-12. The crowd was at its loudest just prior to Thornton scoring the tying, then go-ahead goals. Houde raised the noise level as he kicked, swiped and swatted the ball up the field until it got to Jack Webb. A big man (6-5, 300), Webb was near midfield, well outside of his normal comfort zone near the goal, but he saw CJ LaBreck streaking down the middle and connected with a pass that LaBreck turned into a tying goal with 6:50 to play. After Eli Arsenault forced a turnover in the Falmouth end, it was an alert play on a restart that put Thornton ahead to stay. Falmouth’s top two defenders – Brendan Hickey and Riley Reed – got caught behind the goal after failing to control the ball before it went over the end line. Thornton senior Noah Edborg quickly got another ball positioned just out of bounds for the purpose of quick restarts and whipped a pass to LaBreck as soon as the referee blew his whistle to start play. 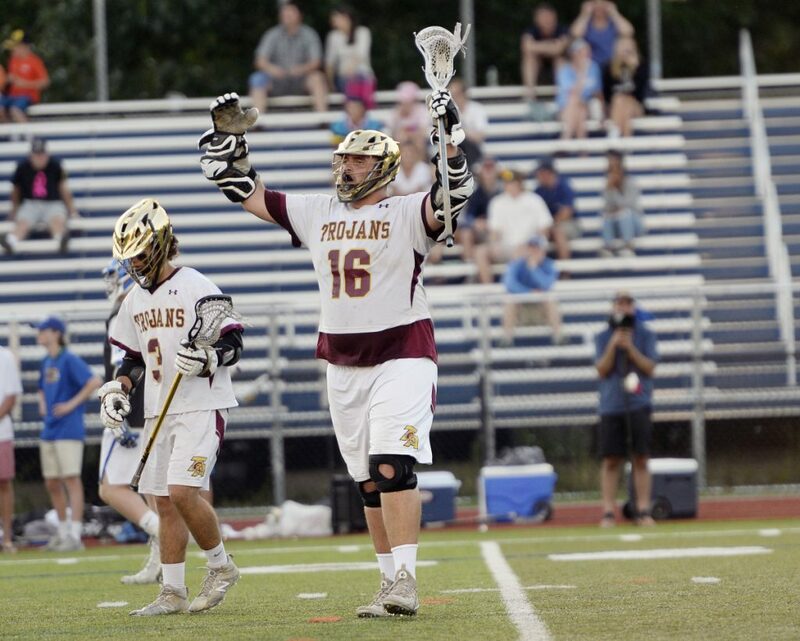 LaBeck buried his fifth of six goals. 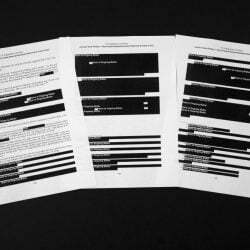 “They just took awhile to get back and were hanging their heads a little bit, and we just had to take advantage of that and (Edborg) found me wide open,” LaBreck said. LaBreck (with 3:20 to play) and Edborg (with 1:44 left) scored to push the lead to 14-11. 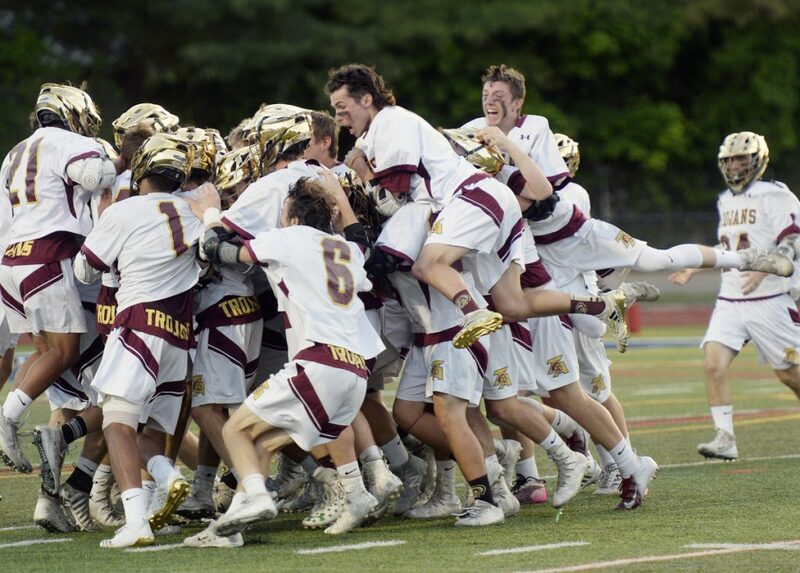 Thornton (15-0) was in its first state final after winning a regional final in its sixth attempt. Thomas Levasseur added three goals for Thornton, with Edborg (2 goals, 1 assist), Webb (2 goals, 1 assist), and Wyatt LeBlanc (goal, assist) contributing offensively. 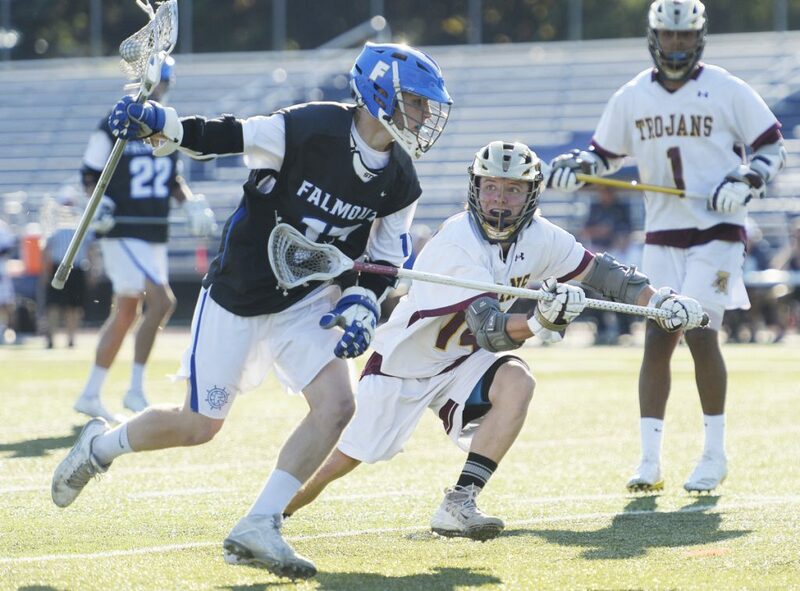 Falmouth (13-2) lost 12-5 at Thornton in the regular season.The rematch was much closer. The game was tied five times and neither team led by more than three goals. 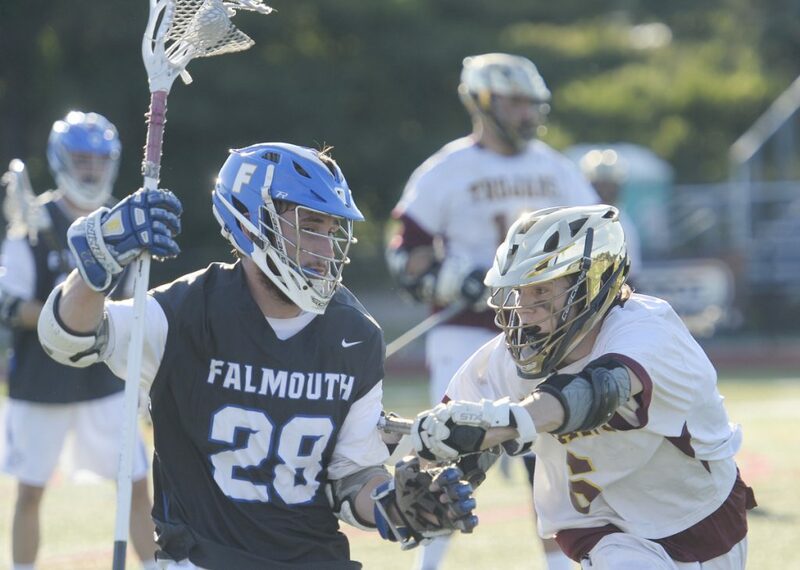 Falmouth got the strong start, scoring four straight to finish the first quarter ahead 5-2. Falmouth was still ahead 11-9 after Nick Farnham (4 goals, 3 assists), scored his third goal with 9:59 left in the game. Reilly Tucker (3 goals), Louis Mainella (2 goals, assist) added multiple points for Falmouth. 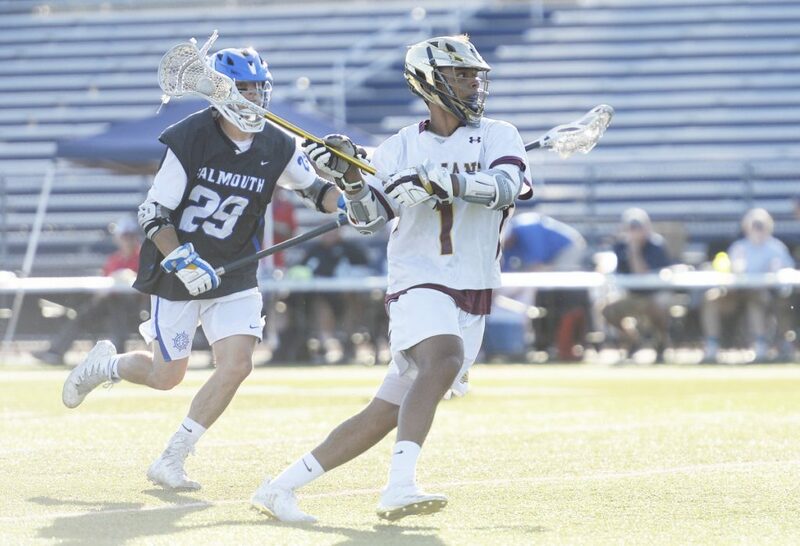 For much of the game, Falmouth was able to extend possessions by working around the perimeter of Thornton’s defense, poking, prodding and then capitalizing on its best looks. Webb started Thornton’s decisive 5-0 run with a goal with 8:54 to play to cut the lead to 11-10. Faceoff man Sam Edborg was a big part of Thornton’s victory. Falmouth’s Lyendae St. Louis had controlled 6 of 8 starts in the first quarter. Edborg won 18 of 22 the rest of the way. “Without a doubt he was the key to our championship today,” Hersey said. 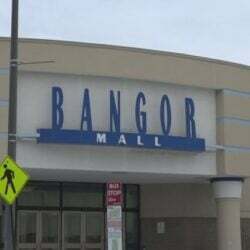 “We ended up hitting the net and I kept winning the faceoff to give us more possessions, so I just gave us more chances to hit the net,” Edborg said. 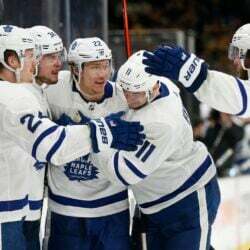 And more chances for several hundred Thornton fans to get excited.